We had a “final exam” for Part 2, just as we had for Part I of the Pixeladies Photoshop Elements Course. Our goal was to combine a number of the tools we had learned and put them to use in a single image. I interpreted the term postcard loosely. For mine, I opened one of my photos and one of my Surfer Sallys in a column layout. Using the Move Tool, I shrunk Sally down and moved her onto the photo. I tried Sally in several sizes, putting her in the foreground, trying to decide how large or small she should be. 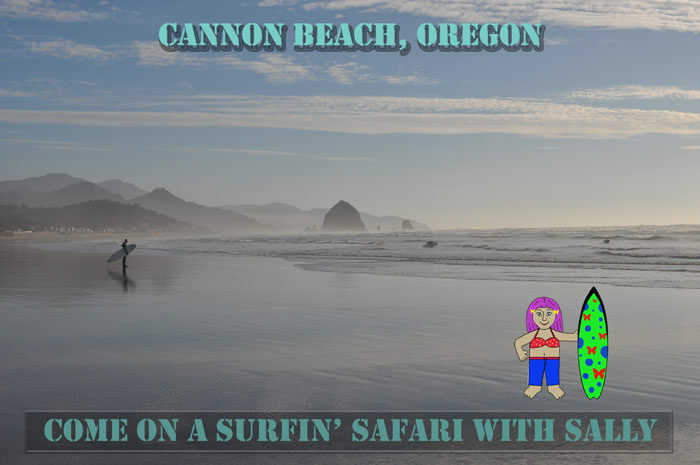 I used the Text Tool to type and center Cannon Beach, added a drop to it, and auditioned colors. Then I used the Text tool again for a message and added a beveled shape around it.